Greeting cards can be a creative and fun way to stay in touch with your clients. 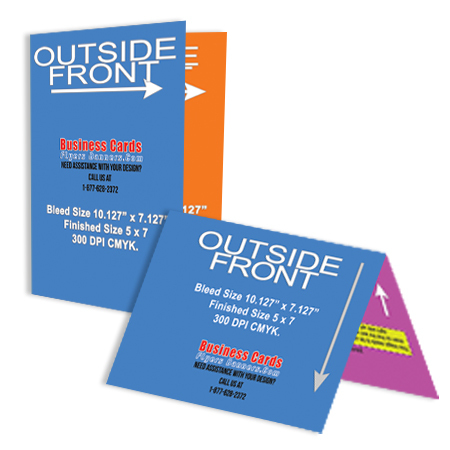 Our greeting cards are printed on thick 14pt Cover Stock with or without UV Gloss coating. Our Cheap prices on quality greeting cards allows you to purchase more than you would normally or the same price or less. Our Greeting cards can also be turned into low price gift card holders by selecting the option to add gift card holding slits. However you decide to use your custom greeting card, if you print with us you will be paying a lot less with our cheap prices. Our Cheap Custom Greeting Card Printing comes printed onto thick 14pt stock with or without a free high shine UV Gloss coating. We suggest the Free UV gloss coating as it allows for the images on the front and back to pop. Use our simple ordering form to see how low our prices are on the quantity you desire.And also note that these ship for free within the 48 US States. Please be sure you use one of our templates to be sure that your Greeting cards are set correctly for production. We will review your Greeting card design to be sure that it fits into our templates before printing. You just need to be sure your images are set up as you like them to appear. And then leave the low price, cheap printing to us when it comes to your Custom Greeting cards.